You know what they say; it’s all in the details. Considering that this small, but important, word – detail – is in the name of my blog, you girls know I’m a fan. But it’s not just about clothes details, fashion details, accessorizing details. I believe the details around us play a huge part in creating that healthy living and work environment that every girl wants to spend their time in. 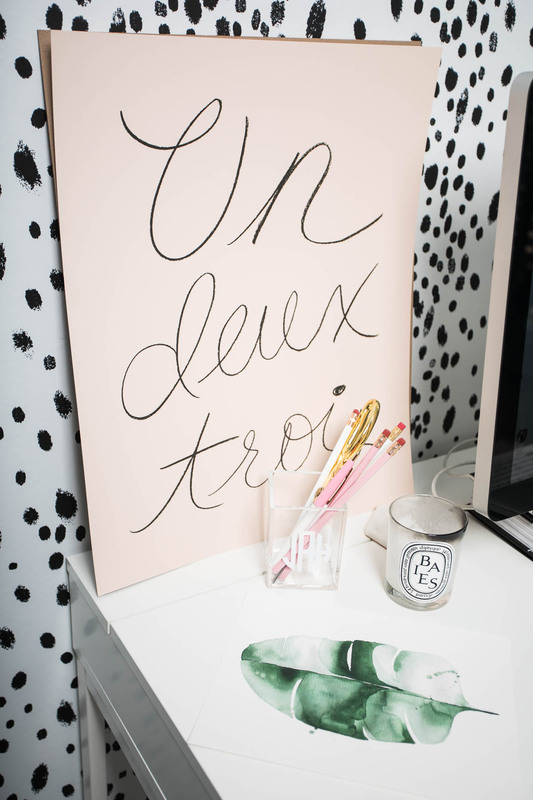 I’m excited to partner with Lulu & Georgia this week to talk those small-but-big-impact office details. If you guys haven’t explored the colorful and bohemian-esque pages of Lulu & Georgia’s online curations — it’s a must. Their curated selection of pops of vintage-esque furniture, southwestern-inspired home accessories and darling prints have me swooning through the pages on their site…weekly. Partnering with the darling online store was a must — after eyeing a few of my favorite pieces there. 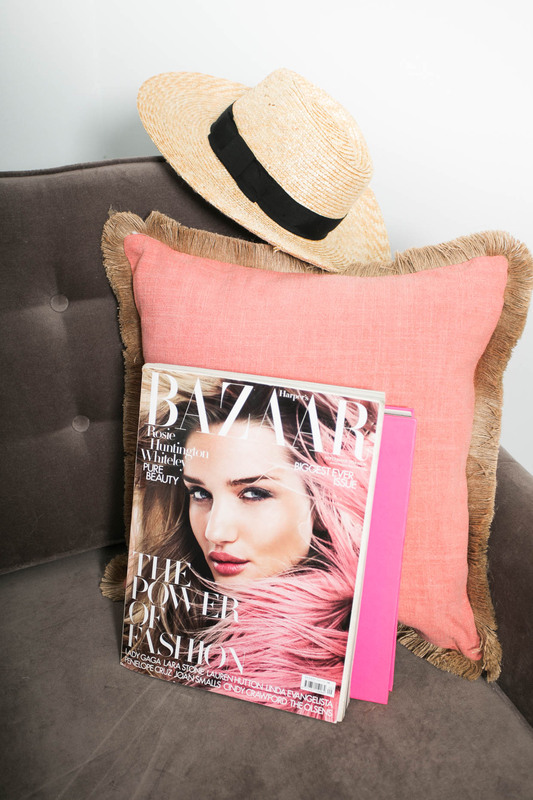 When it comes to office details — I believe simplicity is key. Too many details can become clutter, and a cluttered space or office just adds to the stress of any person’s daily to-do list. So let’s talk details, and how to emphasize the simplicity in the details. Add texture with a rug: I’m a huge fan of sheepskin; rugs add a chic touch that feels so glam. This one stole my heart (and Chloe’s heart) immediately (the color!). Contrast and depth are important: In this case I used a lamp. I have an obsession with keeping things clean and white since I feel like a clean backdrop for work allows for a cleaner mindset. However, sometimes the all white look can feel empty. 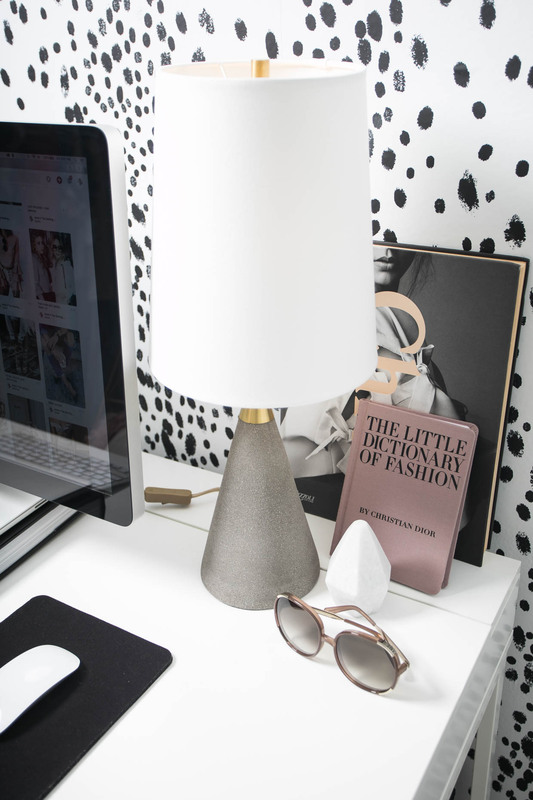 Using heavy items that add contrast (such as this lamp) are a good way to break up the all-white-too-white feel, while still keeping the work space on brand and clean. 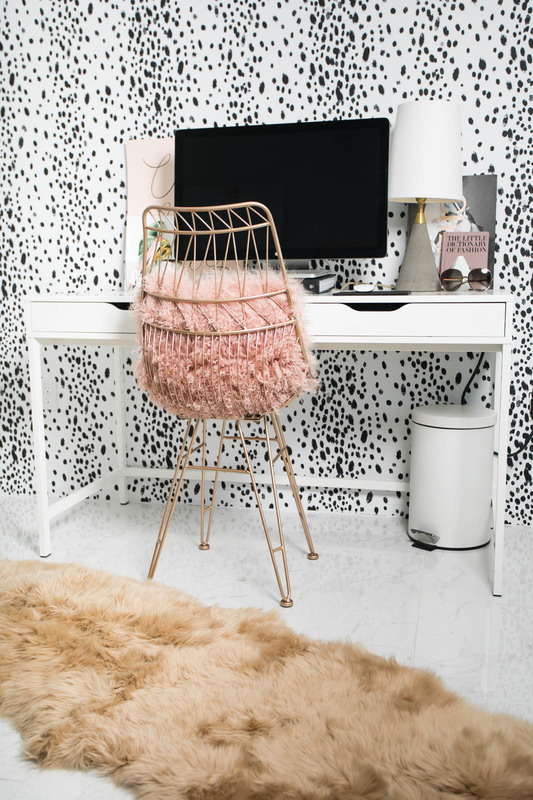 Prints are an affordable way to add pops of color: I was definitely feeling like my office was lacking color, so adding in a larger print like this one by Garace Dore was the perfect fix. I love the effortless look of not framing the print; but framed and hanging would be just as cute. A desk calls for personable details: An object as dainty, classic, and small as this marble piece adds just the right touch to setting a darling office backdrop. This one is out of stock, but Lulu & Georgia has a sweet selection of objects here. Again, it’s all in the details. Pillows make things feel comfy-cozy, and peaceful: Adding a pop of color with a bright pillow did me no wrong. I especially love this pillow because it adds a comfortable and home-y feel to my office, while adding more texture to the mix. I will be releasing my full office reveal this month with more details to come. Stay tuned! Thank you, Lulu & Georgia, for sponsoring this post. All opinions are my own. Love this! Pillows + prints can make any room pop! I love your office! And I also love Lulu and Georgia! Love it, great tips, thanks for sharing! Details definitely make a difference! Loving your fun office space and all the special touches. Your office is gorgeous! Love all the texture! Beautiful room!! I love the prints!! The little details make the biggest difference! Such a beautiful office space! Your office is adorable! I am actually putting finishing touches on mine so this is great inspiration! I am obsessed with that wallpaper! I also believe that detail can create the creativity in every part of living too! Such a lovely pictures!! Specially the pillows! So cute! This office space is major goals! I love the rose gold details! I always loved the dalmation print on your wall, that is just so cool. You have a great office.